Greenwave filters remove dirty electricity, also known as electromagnetic interference (EMI) and dirty power, from building wiring before it radiates potentially harmful Electromagnetic Radiation (EMR) into rooms. Order GreenWave Filters, click here! before you measure Dirty Electricity and use the these filters to reduce the Dirty Electricity. This is the most direct and effective way to target this type of electrical pollution. The less dirty electricity that is flowing along electrical wiring, the less that will radiate into your environment. The filters utilize state-of-the-art EMI filtering technology and are made with the highest quality components and materials to ensure maximum dirty electricity filtration. The circuitry in the filters deploys classic capacitance technology designed to “short out” (or shunt) dirty electricity, while allowing standard 60-Hertz electrical current to pass through the filter unimpeded. The filters are most effective at reducing electrical noise (EMI) between 1 kHz and 30,000 kHz (i.e., 30 MHz). Greenwave dirty electricity filters were designed by a team of EMI experts, including the research and development team of a notable U.S. defense contractor (a leader in EMI filtration) and Richard Ozenbaugh, author of the landmark book EMI Filter Design. An easy to use digital display shows you the amount of Dirty Electricity present on an electrical circuit in your home or office. The GS meter measures the level of harmful electromagnetic “energy” present, and its primary use is to help with effective filter installation. 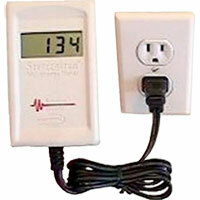 Microsurge meters are low-cost and easy to use by non-technical people. The meters were designed to measure radio frequency “energy” present on AC circuits, which are the frequencies most detrimental to human health.